Adaptive Motorsports & Wellness, a New Hampshire non-profit, treated disabled veterans to an adventure behind the wheel of a racecar. Adaptive Motorsports & Wellness set up shop at the Thunder Road Speedbowl in Barre, Vt. to treat disabled vets to a race car adventure. Veterans like 93-year-old Al Bucharelli, who lost part of his leg in World War II, got to drive a stock car on the track. The non-profit is hoping to expand its offerings throughout New England, and maybe even across the US. A group of military veterans permanently injured serving their country got a big thrill Wednesday, thanks to a non-profit that promotes inclusion and wellness through motorsports. Adaptive Motorsports & Wellness of Plymouth, New Hampshire, set up shop at the Thunder Road Speedbowl in Barre, Vermont, treating several disabled vets to an adventure behind the wheel of a race car. "I've never been in a race car," said 93-year-old Al Bucharelli of Northfield, New Hampshire. Bucharelli, a World War II veteran who lost his leg below the knee to a German shell in Italy, got behind the wheel of a stock car and drove laps around Thunder Road's famous banked track. Bucharelli, who spent most of his life in Charlton, Massachusetts, working in vehicle repair and towing along the Massachusetts Turnpike, seemed comfortable behind the wheel of his new ride, alongside an experienced racecar driver showing him the ropes and keeping an eye on safety. "A-OK," Bucharelli said after completing his laps on the course, reaching speeds of roughly 65 miles per hour. "I survived!" 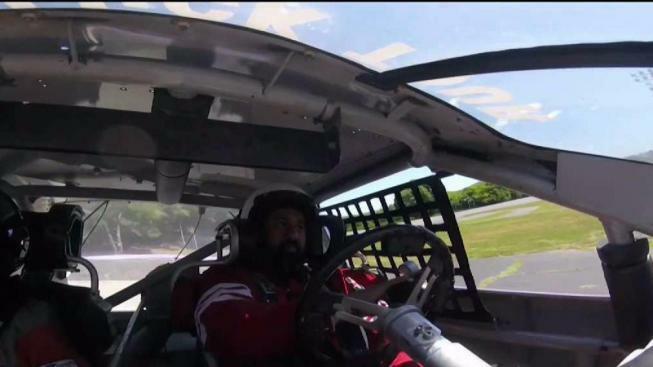 "It's so powerful," said Brian Hanaford, the founder of Adaptive Motorsports & Wellness, describing the experience of witnessing veterans with mobility issues being able to drive a stock car. Hanaford and a team of volunteers use a modifiable vehicle to allow even service members who suffered severe injuries to drive. After losing three limbs to a bomb blast in Iraq 10 years ago, Luis Rosa-Valentin of Maryland never thought he’d be able to participate in such an activity until the non-profit made it possible. "It feels really good," Rosa-Valentin said of his opportunity to drive at Thunder Road. "So good, there needs to be a pause ... really good!" A big goal here, Hanaford explained, is helping participants find friendships and new connections. "They don't have a bunch of camaraderie," Hanaford said. "They've got to get out of that dark area, and that's what we're trying to do." Hanaford said Adaptive Motorsports & Wellness aims to expand its offerings throughout New England, and maybe even across the country.